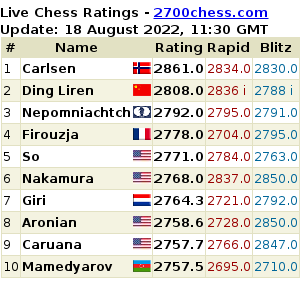 No doubt, the reigning world champion is still on top with 2855, up 4 points from last month. But Vladimir Kramnik, from last month’s 2801, gained 11 more ELO points to take the second spot from Fabiano Caruana for this month’s official FIDE Ratings List June 2016. Wesley So, although lost 5 points by virtue of his game 3 loss to Ding Liren, is still at No. 10, but now tied with Vishy Anand. Chessbase lists the complete top 100 and discusses about the top climbers and descenders in the list, among others. Not 2855! :/ make it the 1st Man to be (+)2900.